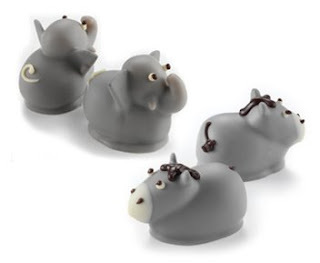 Just in time for the election in November, Moonstruck Chocolate Company, creators of the world's cutest truffles, has put together yet another adorable treat. Their new Election Collection is the perfect solution for all you frustrated voters out there who can't stand another minute of you know who! Imagine the pleasure you'll get from biting off the head of that elephant . . . uhhh or donkey . . . whichever the case may be. Actually, after reading the ingredients, I'd much rather eat the cinnamon and almond-flavored donkey (mmmm) than that boring old dark chocolate elephant (yawn) any day. Now, this whole truffle discussion could easily transition into a full-fledged political rant, but I think I'll take a tip from my edible friends and keep my mouth shut! Let this be a lesson to all of you. The next you feel like engaging in a little partisan bickering, just act like a little animal-shaped truffle instead. If these two inanimate objects can live together in peace and harmony, so can the rest of us. You can order yourself a little election night diversion online or, to find a store near you, click here. haha, those are super cute. and delicious too, i'm sure! Would You Like Some Bread with Your Sprinkles?